Umbel of Queen Anne’s lace. (Source: Wikipedia.com). To floriculturists – those botanists who specifically study flowers – it is known as Daucus carota. To you and me, it is called Queen Anne’s lace. Look again at the latter half of the plant’s Latin name. Carota. Add an r. Remove the a. Take one more look. Indeed, Queen Anne’s lace, that tall, hairy, white-flowered, ubiquitous meadow and side-of-the-road dwelling weed – yes, it is considered a weed – has another name due to the edibility of its roots. The wild carrot doesn’t look like the kind that you find at the grocery store, but it tastes like a carrot and smells like one, too, so its unusual appearance hasn’t stopped people from eating it. Its consumption goes back thousands of years. Ancient Greek physician Hippocrates noted its seeds were crushed and used as contraceptives. Others claimed it had use as an aphrodisiac and stimulant. In the Middle Ages, it was a remedy for bladder and kidney problems – and it is still used to treat such maladies to this day. Like “normal” carrots, this variety is chock-full of beta-carotene, a chemical with anticancer benefits. It also helps improve eyesight. Beyond the roots, the flowers and leaves can be eaten, too. Both can be chopped up and tossed into a salad. Queen Anne’s lace can be easily identified by its unique clusters of little white flowers, which are collectively known as the umbel. The feathery leaves attach to a hairy green stalk that can grow one to four feet in length. When you’ve found a plant that vaguely resembles that description and have yanked it out of the ground, check out the roots. Are they long and thin, like fingers? Are they woody and pale in color? You might be looking at a free, delicious carrot. There is a very important warning to add here. Queen Anne’s lace bears a striking similarity to poison hemlock, a considerably more nefarious plant that is perhaps most famous for killing philosopher Socrates. Poison hemlock is not to be messed around with – if it can bring down one of the greatest thinkers of all-time, it can be your downfall, as well. Even if it doesn’t kill you, it will provide a thoroughly unpleasant experience that can have permanent, long-term effects. At best, you’ll experience a multifold increase in saliva production, intense pain in the digestive tract, swelling and stiffening muscles and an unsteady heartrate. At worst, you’ll end up paralyzed, your muscle tissue will break down, your kidneys will fail and you’ll have to spend the rest of your life explaining to people why you are in a wheelchair – that is, if you’re still able to speak. In short, use caution and common sense. Mushroom hunters don’t eat random fungi they pick off the ground without knowing what they’re ingesting. Likewise, you shouldn’t go and find the nearest snow-colored plant, rip it out of the soil and consume its roots because they resemble carrots. You are encouraged to explore the uses of this plant further, but you must practice due responsibility. Not all weeds are bad. Some are known as beneficial weeds. Unfortunately, Queen Anne’s lace doesn’t quite fall into that category. 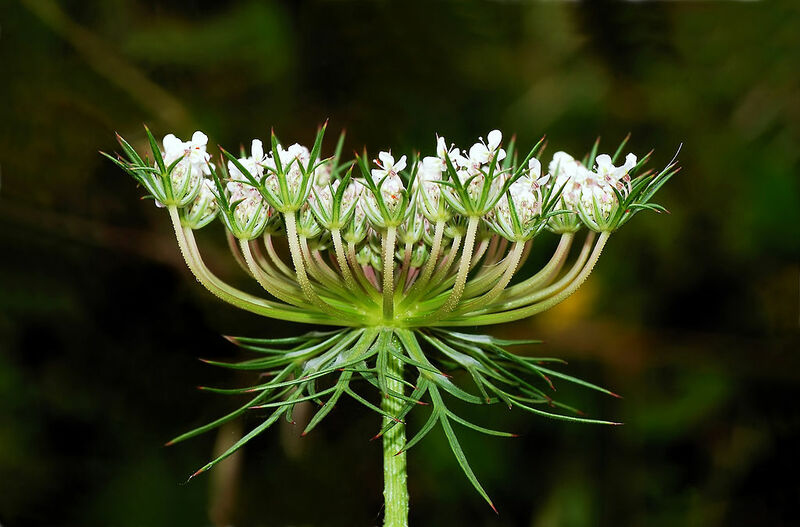 Listed as a noxious weed by the states of Iowa, Michigan, Washington and Ohio, this plant – an introduced species native to Europe, Asia and North Africa – kills off endemic grasses by over-utilizing their resources. 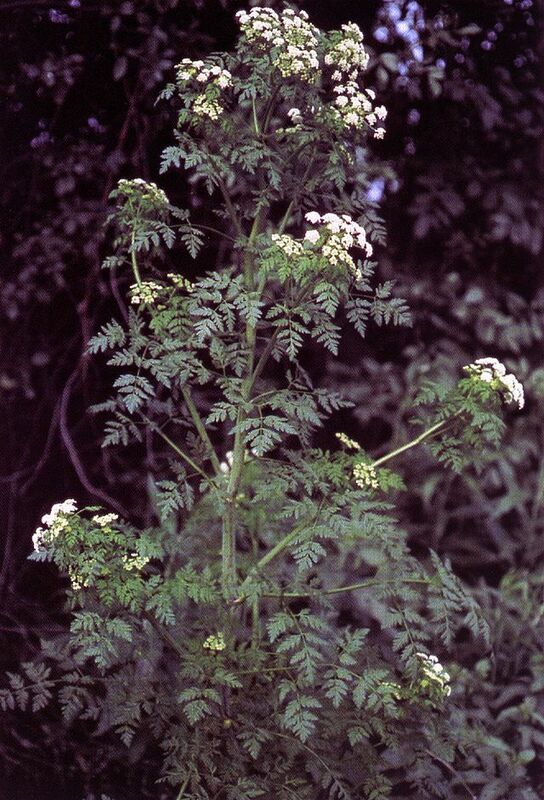 It may hybridize with commercial carrots, decreasing their quality and it might be mildly harmful to livestock. But perhaps the plant gets a bad rap – when used and maintained properly, it helps attract pollinating insects in droves, which aids nearby plant propagation. A few Queen Anne’s lace scattered throughout a tomato field can increase fruit production. Plus, it’s pretty, plentiful and edible. With a little elbow grease, it can be pulled from the earth at a cost of only a few calories spent. It’s free food. Who doesn’t love free food? This entry was posted in Edible plants and tagged carrot, edible, flower, plant. Bookmark the permalink.